The most curious announcement from Google, at their I/O conference this week, has been the "Nexus Q". At a Sony-Google TV event in May, Google Product Manager Eric Liu was asked if a Nexus-like device might become available for the TV platform. The question pertained to the status of the Nexus-branded products as Google-endorsed platforms for application developers. Up until the Q announcement, Google has relied on partners such as Sony and Logitech to design and build Google TV devices. Just before the 2012 International Consumer Electronics Show, Google announced that LG, Samsung, and Vizio would join Sony, and after Intel dropped out, Marvell and MediaTek would provide chipsets. Liu's answer, "I can't answer that, but it's a good question", was a coy way of hinting that the Nexus Q was on its way. 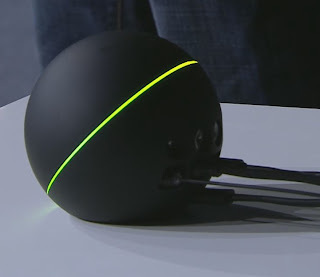 The Nexus Q is a $299 streaming audio/video player, which is limited in functionality to playing your (or your friend's) Google Play content from the cloud, that you (or they) have purchased or uploaded. You can also play videos from YouTube. At Google I/O, the company expressed great pride in the sleek industrial design of the Q, which was created by the company's own engineers. Google is planning to sell the device directly to consumers, and is taking pre-orders for mid-July shipment from the Google Play store.The top hemisphere is a rotating volume control, with a touch sensor for on/off muting. The Q also has a ring of 32 RGB LEDs, which provides a varying visual element to amuse users. Google is billing the Q as "the first social streaming media player", hence the ability to also play content from other Android device owners. This dubious distinction allows others to add their content to the queue for your Q, and even - as Google excitedly demonstrated - take control of the player. In Google's view, this is apparently "pretty cool". 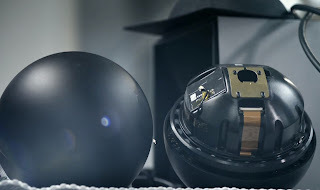 The application processor in the Nexus Q is Texas Instruments' OMAP4460, a dual-core ARM Cortex-A9 which integrates the Imagination Technologies' SGX540 graphics processor. This is the same application processor as Samsung used in the Galaxy Nexus LTE. The Q provides micro HDMI, RJ45 ethernet, micro USB (for "hackability"), optical Sony/Philips Digital InterFace (S/PDIF) audio, and RCA banana plug speaker connections. Wireless connectivity includes 802.11 b/g/n WiFi, Bluetooth, and NFC. A 12.5 watt per channel Class-D switching amplifier is built in for driving the speakers, which Google declared to be of "audiophile quality". 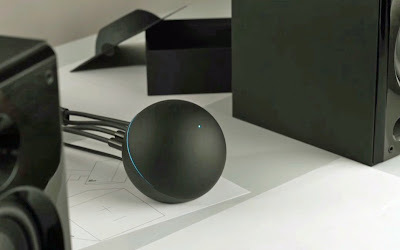 Top amongst the curious aspects of the Nexus Q, is how Google expects to convince consumers that this is a good value for streaming content, which is limited to Google Play, to an audio-video system. For the same $299, consumers will be able to buy 3 of the just-announced $99 Vizio Co-Star, which will support all of the same Google Play content, as well as other streaming apps such as Netflix. Or, since an Android device is required to control the Q, consumers can simply connect their smartphone or tablet directly in many cases, over built-in HDMI or MHL connectors. Samsung provides one of the authorized MHL test centers, and has incorporated this capability in the Galaxy Nexus smartphone. For the additional $200, buyers get a cheap 25 watt amplifier, the ability to synch multiple devices throughout the home, and the aforementioned "social streaming" capability. An even better option, for audio at least, is to buy a $199 pair of Audioengine 2 powered speakers, which will come much closer to delivering an "audiophile quality" experience.